One of the things that often kills cancer patients isn’t just the invasiveness and spread of a tumor but the physical wasting, known as cachexia, that the disease can cause. It includes wasting of the muscles, adipose (fat) tissue, and gonads, and is accompanied by general fatigue, weakness, and loss of appetite. Because of the complications cachexia can cause to late-stage cancer treatment, you can imagine how important it is to both understand and treat it in order to give a patient his or her best chance at beating the disease. Just this month in the journal, Developmental Cell, two separate teams of investigators have published evidence pinpointing the major molecular culprit in this wasting disease and how it does what it does [1, 2]. Both teams used fruit flies as cancer models. 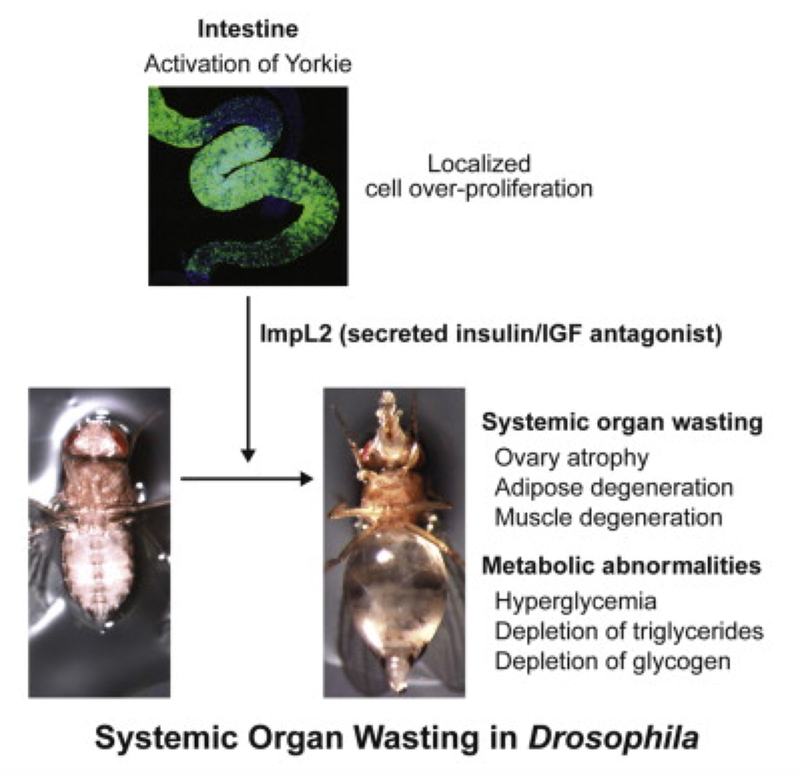 The first team transplanted tumors into Drosophila in order to induce wasting, meanwhile the second group developed a genetic cancer model utilizing the fruit fly oncogene, Yorkie. Illustration from Figueroa-Claravega & Bilder (2015) of the tumor transplantation model. What each of the teams found with their respective fruit fly cancer models was that cachexia was driven primarily by a reduction in insulin signaling, leading to system-wide insulin resistance and poor glucose uptake into the cells. Thus, cells were starved of the vital energy they needed for basic metabolism and instead wasted away. Stores of fat were quickly depleted and muscle was subsequently sacrificed for its glycogen reserves. 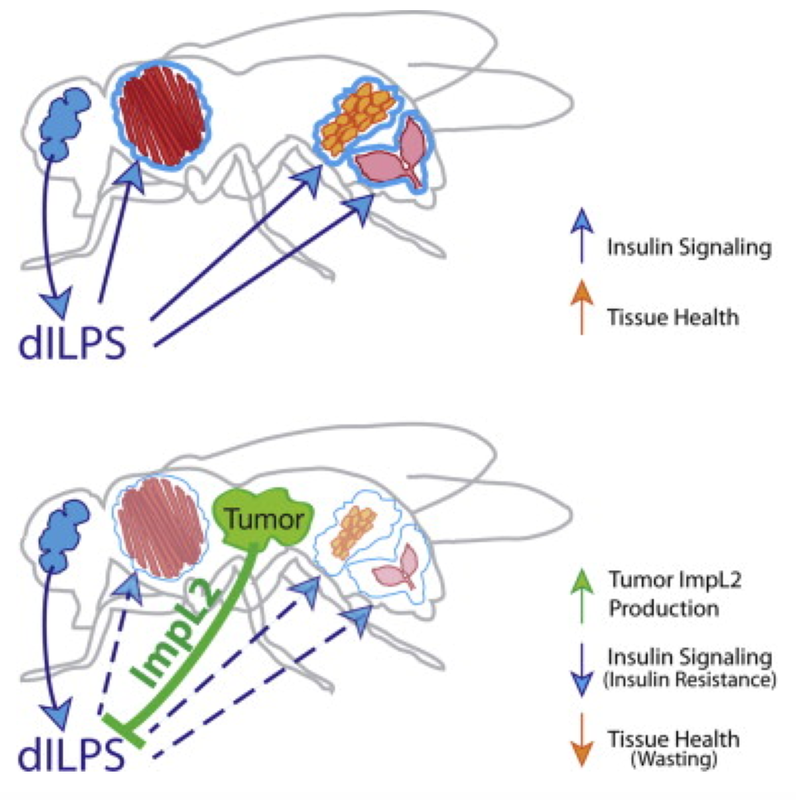 The researchers found that the molecule, Impl2, a fruit fly homolog of the human protein, Insulin Growth Factor Binding Protein (IGFBP), was an antagonist of insulin and was secreted heavily from malignant tumor cells, leading to insulin resistance in even distant tissues. So why are a couple of insect models of cancer wasting so potentially important to human patients? Aside from the fact that these models help scientists understand the makeup of cancer better, most importantly it offers a means for preventing cachexia and therefore potentially deadly complications to cancer treatment. If scientists are able to produce a medication that antagonizes IGFBP that drives cachexia in the first place, late-stage cancer outcomes could significantly improve. So, in spite of Sarah Palin’s poor grasp of medical and genetics research, studying a bunch of fruit flies has everything to do with the public good. I kid you not.